Thanks to the LCD technology is possible to show highly readable text messages. 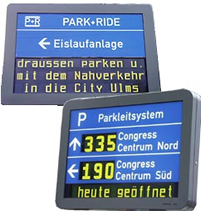 The products that we propose include a series of LCD displays with mosaic or dot matrix modules. The characters visualized by the mosaic module are very similar to the printed characters, in order to obtain pretty text messages. The dot matrix modules allow to visualize special characters, such as Chinese and Thai, obtaining a major flexibility. 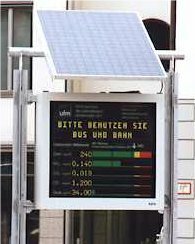 The aim of an Ulm University’s study was to find out which information medium and which passenger information board is most readable for people. Three standard dynamic information displays with similar dimensions, which are normally available on the market, were hung up next to each other and shown to test users. The information which was shown on the three display was always the same. 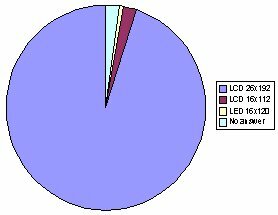 The result of this study concludes that the majority of people prefer passenger information with LCD displays because of readability and appearance and they decline the LED boards. More and more people are concerned to know about the quality of their environment, especially air quality. Every summer the concentration of the air pollutant ozone rises. LCDway information boards provide up to date information to city residents. The message can be shown in text as an alternative to the easily readable bar-graph display. The data can be accessed directly by telephone using, for instance, the T-Online service. Parking spaces in our cities are always in short supply and need to be used in the most efficient way. Our information boards can be especially helpful in this situation. The number of empty spaces remaining can be shown, along with directions for use of a park and ride system. This results in much improved city traffic management and reduces time spent searching for a parking space with the resulting negative impact on the environment. The text lines of the display can of course be used to show latest city news and information. 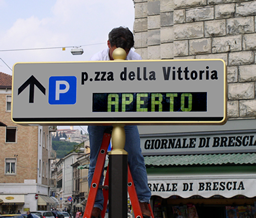 The excellent readability of our displays even in direct sunlight makes them especially suitable for installation in, for instance, pedestrian zones. The attractive design can help improve the city image. The low energy consumption keeps running costs to a minimum. 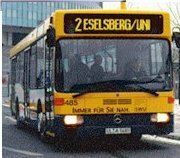 LCDway can also be used to shown information about bus destination thanks to its readability.